Controls for TRS, HDC and air suspension. Depending on the setting, TRS automatically makes changes to the engine, transmission, air suspension ride height, stability and traction control systems, ABS, the center and rear differentials, and Hill Descent Control. “We analyzed the characteristics of nearly 50 different types of off-road surface, and determined the vehicle system inputs necessary to optimize performance on each,” said the LR3’s chief program engineer Steve Haywood. HDC is an award-winning technology that automatically slows the SUV’s downward progress in the four off-road TRS settings. Using the anti-lock brakes, the car will inch its way down a hill without the driver touching the brakes. This can be an eerie feeling and one of things taught at the driving school is to learn to trust that the car won’t suddenly ease up and careen wildly down a steep boulder-strewn incline. 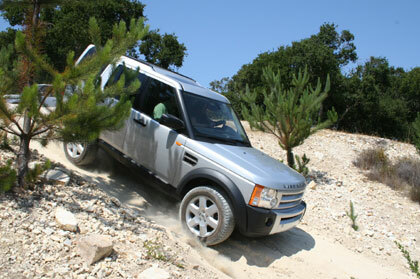 Land Rover’s computer-controlled air springs work in concert with TRS to provide the optimal ride for on-road and off-road conditions. In the “rock crawl” and “mud and ruts” settings, the maximum ride height is selected, while in “general driving” the suspension is lowered to limit body roll and improve handling. 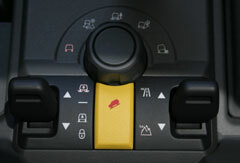 These different heights can also be controlled manually using a control on the center console.